Muto door system ... slim and elegant. Dorma+kaba, a key global player in opening solutions, has launched Muto, a new multifunctional manual sliding door system. Muto is perfectly designed with a slim, elegant body. 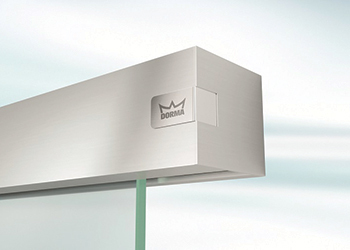 Its compact and clear sharp edge is implemented to represent dorma+kaba’s design and new style. The sliding door system is available in aluminium finishes, white, silver and similar satin stainless steel and can be matched virtually to any architectural interior. Commenting on the launch, Noushath Ahamed, product marketing manager, dorma+kaba, says: “We are delighted to launch Muto, our new multi-functional manual sliding door system with self-closing action and a concealed electromechanical lock. The Muto Basic is specifically designed for wooden doors, but clamps can be fitted to accommodate glass. Without the need for a power supply, the door can be self-closing. And the locking device can be operated by a remote control or a wall switch, thus avoiding the need for floor locks. A status indicator can also be integrated to enable monitoring of the door from anywhere in the building. As door requirements change, the damping, locking and status indicator equipment can be retrofitted in the Muto Comfort profile at a later date. Muto offers standard wall, glass and ceiling mounting and installation in suspended ceilings and is designed to serve a wide field of applications. Muto Comfort with roller carriers for glass as standard can, with appropriate adapters, also carry timber panels. On the other hand, in the Muto Basic system, the roller carriers can be directly fixed to timber panels, while adapters allow the use of glass panels. The weight range extends from small single panels of 50 kg to bi-parting panels up to 150 kg per panel. In the Muto Basic system, a panel may even weigh up to 200 kg. Muto systems, with the help of dorma+kaba’s clamp and glue technology, can be used with laminated glass. This technology allows glass to be held securely. Sanitary fittings manufacturer Grohe in association with Philips Sound has launched Aquatunes, a waterproof Bluetooth speaker, bringing customers a high-quality, immersive musical experience in their showers or bathrooms. The speaker is the result of collaboration between two brands with a strong track record of innovation: Grohe, the bathroom and shower experts, and Philips, a leading brand in audio systems. It is easy to connect the speaker by pairing it with any smartphone, tablet or Bluetooth-enabled device. And with a range of up to 10 m, it is simple to keep the playing device safe and dry. CE-certified and 100 per cent waterproof, the loudspeaker easily withstands not only the jets of water but can also handle falls from a height of up to 1.5 m.
“Thanks to its anti-slip holder, the wireless loudspeaker can be used on all shower rails with a diameter between 20 and 25 mm. This means it will sit securely on 70 per cent of all shower rails and is also suitable for other places. 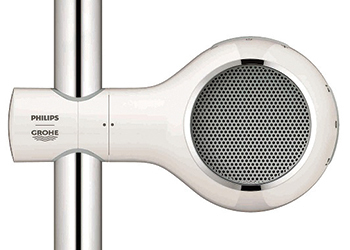 To recharge Aquatunes, just remove it from the shower rail and place it in its handy charging station. The multifunctional dock also serves as a holder for the loudspeaker, which means that the battery can be recharged while still listening to music,” he says. In addition, Aquatunes has clearly marked buttons – on/off, volume up/down, previous/next track and for Bluetooth pairing. Two LEDs (light emitting diodes) show the status of the Bluetooth connection. The Siecle collection ... 17th century decor. 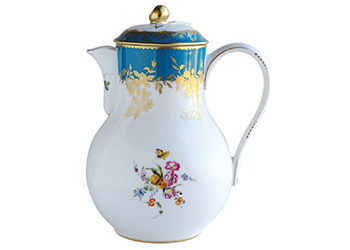 French porcelain manufacturer Bernardaud has unveiled its new collections for this year. This includes Sol, a radiant collection with a firmly contemporary style. It is available in five colours: the gold version is perfect for a festive and bright table, and its Lazuli blue, Myrtle red, Cashew brown or Spring green versions may be combined for a fresh and unique table. The coloured Sol ranges perfectly match the Argent collection pieces, which are the same shape but are white and adorned with a fine glossy platinum trim. Bernardaud also presents its pink and almond Cronos collections, which subtly combine matt with glossy in soft, spring tones. Accentuated with a broad gold trim on very flat plates, they go well with the Cronos Blanc collection. The Sauvage collection represents the appearance and texture of the lizard skin, illuminated against an ivory and gold background. Finally, the Siecle collection is described as the perfect impression of 17th century decor. The collection features sky blue trims, frames, garlands of flowers or bouquets of painted flowers, arranged so as to create a pastiche of a confusing reality. The freshness of the colours in the floral compositions and the brightness of the blue will give a table a sense of both grandeur and warm hospitality, says the manufacturer.